Experiencing roof leakage and ceiling leakage? The roof of a building plays an important role in protecting the structure, its occupants and items therein from damage by extreme weather and environmental conditions like, rainfall, and high temperatures from the sun. Considering the roof is the main shield from all these threats, it experiences significant abuse that could easily contribute quick tear and wear if not accorded proper care. One of the most effective ways for ensuring your roof is preserved in the best condition over time is through roof waterproofing. Unlike other waterproofing tasks in building and construction, roof waterproofing requires skills and a better understanding of the right waterproofing materials and membrane system. And, that is the main reason you should always let professionals handle the waterproofing of your roofing systems. Waterproofing Singapore are the experts that can provide tailor made roof waterproofing services for your residential and commercial, and industrial property. We have many years’ experience on the job, which has enabled us to always deliver the best roof waterproofing solutions in Singapore. When your roof is waterproofed, it will be able to effectively withstand various elements of damage including, leaks. The roof waterproofing membranes used in the procedure are quite strong and long lasting. As a result of this, the roof and entire building is able to remain in better shape for a longer period of time. In fact, waterproofed roofs usually last longer than standard roofs. Roof waterproofing creates an additional protective cushioning for your building, ensuring that cool air is retained inside while the strong heat from the sun is reflected away. Due to this, you will not have to use a lot of energy in air conditioning, thereby significantly cutting down the cost of energy for the building. Within just the first few weeks of roof waterproofing, you will be able to see a change in your electricity bills. Roof waterproofing can also go a long way in reducing the environmental footprint of your building. One of the reasons for this is, roof waterproofing reduces the use of energy in cooling off buildings. Besides, the fact that waterproofed roofs can stay for longer without replacements or maintenance also ensures less environmental impact. Whenever your roofs are waterproofed, you will not be bothered with frequent repair and maintenance on the roofing systems. In fact, the roofs can last for many years without the need for replacements or repairs, which will enable to save quite a lot of money on the side. Coupled with the lower electricity bills, waterproofing roofs for your commercial property will also ensure greater savings in terms of overall operational costs. At Waterproofing Singapore, we can help you achieve all the benefits of roof waterproofing discussed above. In every project, we always strive to deliver lasting solutions so your roof and structure is kept in the best condition over time. 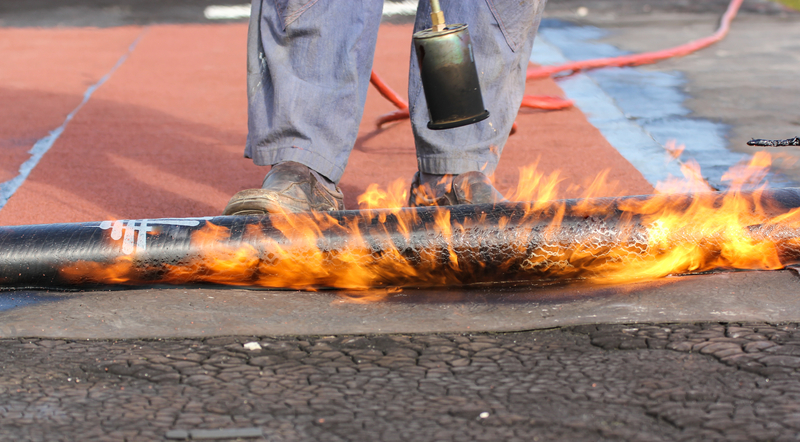 While performing roof waterproofing, we focus on meeting diverse customer demands through tailor-made roof waterproofing materials and methods. Our company specializes in professional roof waterproofing services for residential, industrial, and commercial developments across Singapore. To us, every roof waterproofing project is unique and, treated as a single entity. Before we begin the procedure, we always conduct an evaluation of the property in order to determine the best approaches to pursue. The inspection is conducted by our experts, who will be sent to your site in the shortest time. All our staff are well trained and trusted to effectively conduct the inspection even in your absence. Based on the recommendations of the inspection, we will prepare and submit a free estimate in consultation with you. We can offer roof waterproofing services for both new and existing constructions. After making the necessary preparations, there are various roof waterproofing materials and methods that we can apply. However, the particular waterproofing materials and techniques for your roofing system will be based on type of roof as well as your needs. In case you are refurbishing an old building, we may sometimes recommend that parts or the entire roof is replaced before our experts perform the procedures. For convenience, we also provide professional roof services. Some of the key waterproofing materials and methods that we can use for roofs include, waterproof paints, waterproofing sealants, liquid waterproofing, tile waterproofing among others. Besides, we also stock superior quality roof waterproofing membrane. Our company has a team of waterproofing experts who understand the most effective and efficient roof waterproofing approaches to bring out the best in your roof. In every project, we will only use the best roof waterproofing products and techniques, which are eco-friendly, durable and, also affordable. At Waterproofing Singapore, we are accredited and are committed to creating long term relationships with all our customers. And, that is why even after offering the required roof waterproofing services, we will still leave our lines open to offer any assistance. In case you experience leaks or other hitches on the roof after waterproofing, we can still come to your aid and deliver a suitable remedy. However, we always strive to provide lasting roof waterproofing solutions so you are never faced with problems on this part of the structure anymore. The first step to obtaining our roof waterproofing services is requesting a free estimate. Through the estimate, you will be able to know all the required procedures and related costs in advance for proper planning. We can always prepare and deliver an accurate roof waterproofing estimate that perfectly suits your budget and needs in the shortest time. Simply talk to us for a free roof waterproofing quote.